Under a proper maintenance routine, a modern garage door’s life expectancy can be greatly extended beyond its manufacturer standards. It can also help ensure its safety and optimal performance. Don't worry. You don't need to do it yourself. Our team of professional technicians can do maintain your automatic door for you. Our first task is to check the conditions of your door - from the bottom seal to the spring and the motor. Some components don’t necessarily show visual signs of wearing. That is why we run tests to check their status. The testing of the opener's sensors is equally important as they are the parts of the system that are responsible for reversing the door in case someone or something gets in its way while it’s closing. Count on us to make all the necessary adjustments to your automatic system as part of our maintenance service. 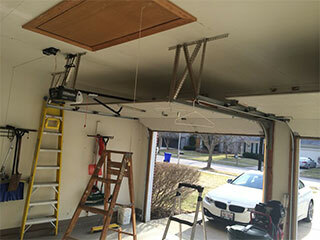 Our professionals are experts in setting the spring tension and opener force limit accurately to keep your garage door in optimal condition. Lubricating its various moving parts is another important task, and our technicians do it with the utmost care. It’s crucial to apply the right amount of the appropriate product in the right places. If our team comes across any problems while performing our tests and inspections, you can count on us to resolve them in the shortest possible time. If there are any worn-out or damaged components we’ll replace them. It’s not uncommon for our specialists to find frayed cables, bent hinges and rollers with twisted stems. Rest assured the new parts we'll install will be of the highest quality. It’s our goal to keep your door in top shape and ensure its perfect operation. At Garage Door Repair Chula Vista, we provide maintenance services to doors, springs and openers of every shape and size. Contact us today to have your problems solved in no time.